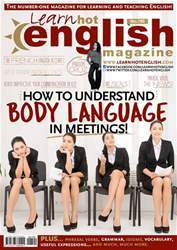 Digital Subscriptions > Learn Hot English > 190 > BODY LANGUAGE IN MEETINGS! You can understand a lot about people by studying their body language. Learn the meanings behind these typical examples of body language in meetings, and use the information to your advantage! Look at the paragraph titles and pictures. What do you think the writer is going to say about the topic of each paragraph? Make notes. Read or listen to the article once to compare your ideas from the Pre-reading task. 1. A firm handshake a sign of________ . 2. Crossed arms could communicate that we aren’t willing to ________. 3. A blank look could show that you aren’t ________. 4. Try to maintain eye contact between 70% and ________ of the time.